Step 1: We gotta kill you. Step 2: We skin you down. Step 3: We separate out your fat, muscle, skeleton, and internal organs into nice, neat piles (okay — maybe not so neat), and determine the mass of each of them. Ready to test with us? Okay, okay – so truthfully that’s not our normal go-to answer unless we want the phone hung up and the Nashville PD called on us at about step 1.5. Furthermore, there are a couple members of our team that probably couldn’t even make it halfway through a re-run of ‘The Walking Dead’ with their eyes closed, much less imagine working up close with human cadavers. But there is some truth to this twisted humor that reflects the challenge of accurately assessing body composition. Unlike jumping on the scale to measure your weight or stepping underneath a stadiometer to measure your height, it’s not possible to just directly “measure” your total fat or muscle. Even at the highest levels of scientific research, the state-of-the-art equipment used has strengths and weaknesses, often relying on a prediction or equation set when assigning body fat percentage. For analogy-driven folks, imagine trying to navigate a submarine through the pitch-black depths of the ocean. With no way to magically “light up the ocean,” you’d have to rely on several different tools – each painting their own piece of the picture – to accurately determine where you are and track where you are going. Periscope – (at shallower depths) provides visual imaging of the water’s surface to identify landmarks and targets. Active Sonar – emits sound waves that reflect (echo) off surfaces to help map objects and the ocean floor. Depth Gauge – uses pressure changes to determine how far below the surface the submarine is. When it comes to assessing body composition, a similar multi-tool approach ultimately helps best “illuminate” the elusive body fat percentage number, but more importantly for the majority of us – track body change. At the Transformat10n Lab, we created a profile of body change tests to examine several different progress markers including body surface, fat thickness, and body density change. Together, these markers provide a comprehensive answer to the questions: where am I at and how am I progressing? 3D Body Imaging – captures a visual image (avatar) of the body’s surface including key circumference measurements. 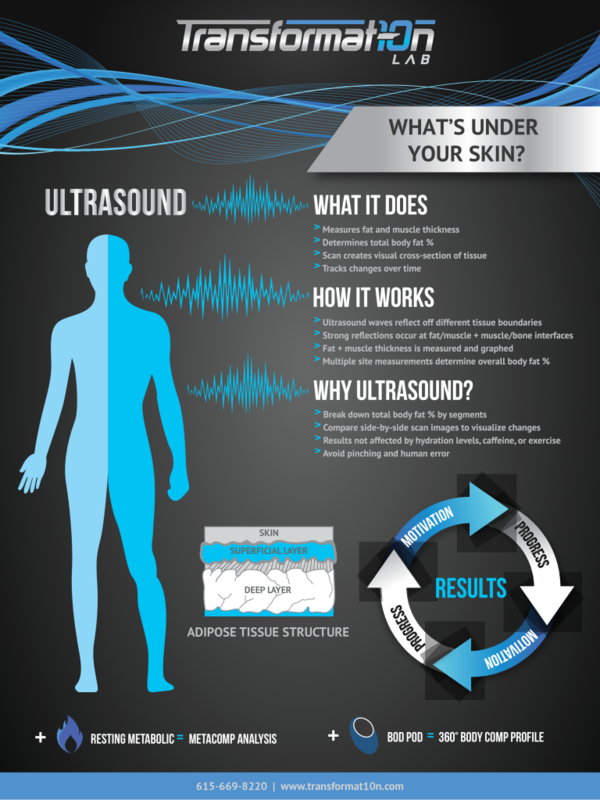 Ultrasound – emits ultrasound waves that reflect off tissue boundaries to measure fat thickness at key sites on the body. 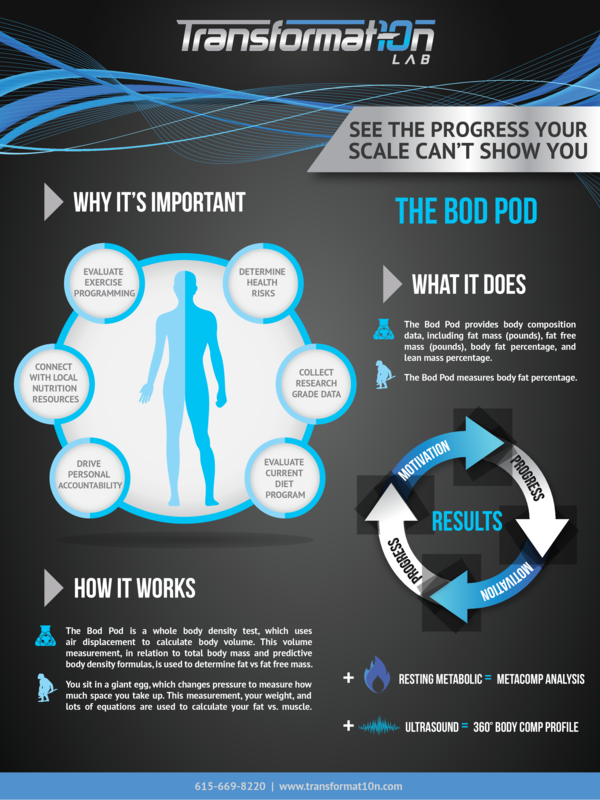 Bod Pod – uses small air pressure changes to measure and track changes in whole body density over time. In summary, we map the surface of the body, measure fat layers beneath the skin, and then measure to the core via body density. This multi-tool model is commonly referred to as composite assessment – and variations of composite testing such as the 4C model are currently considered the gold standard in research when assessing body composition. 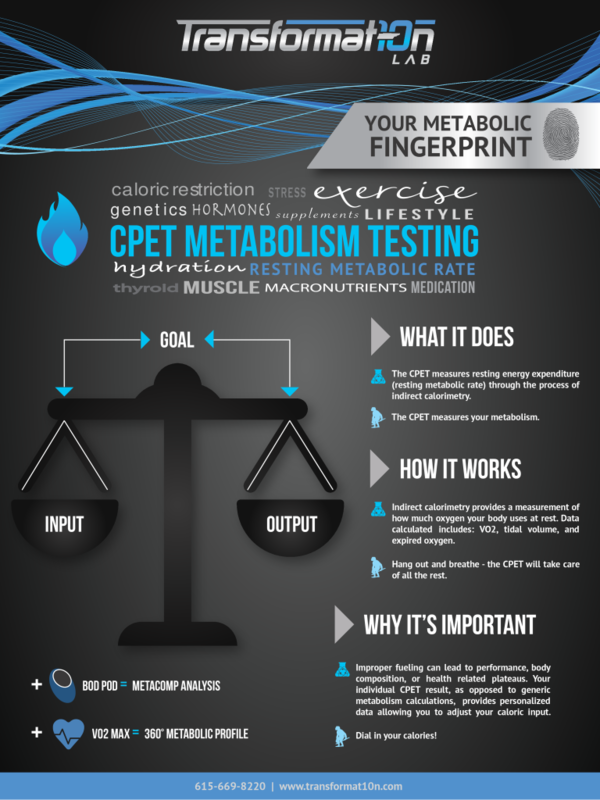 Track using valid, consistent methods – If a body composition assessment is heavily dependent on fluctuating factors like hydration or has the potential for human error, your ability to use that data for tracking progress – the most important factor in testing – could easily be compromised. Combining results from two research grade tests such as Hydrostatic Weighing, Bod Pod, DXA, and Ultrasound is a good starting point if the equipment is accessible in your area. Compare like results with like results – A few weeks back, one of our clients at the lab came to us looking for answers when her skinfold calipers assessment with a trainer didn’t match up to her body fat assessment on her portable BIA scale. Our answer: they are measuring two very different things! Regardless of feelings on how accurate/inaccurate certain forms of technology are, the bottom line is that it’s impossible to cross-compare results from two different testing mediums. Find a facility or testing method(s) that you are comfortable with and use that equipment consistently. Combine hard analytics with “the feel test.” — Data is awesome. As lab nerds, we love nothing more than to see our clients’ hard work and healthy lifestyles show up as continued linear progress in either fat loss or muscle gain. However, we also know that sometimes body change is frustrating, slow, and just downright unreasonable at times. There is a legitimate army full of additional variables (think stress, hormones, past nutrition habits, etc. ), some of which are within our control and some of which are not. Test data should provide a checkpoint, but it will never tell the whole story. Listen to your body. If you are feeling and performing better – keep on rolling. If you need to make an adjustment, make an adjustment. But you should never let a test number redefine you or your goal! For those in the Nashville area – we’d love to have you by. You can view our test options and packages here. Not in middle Tennessee? Shoot us a message via our contact form and we’ll do our best to direct you to some equipment/facilities in your area.